In scoliosis the spine is bent and twisted in three dimensions. As a result, the range of body motion differs between right and left. It is striking to observe that the distortion of the spine most commonly arises or is aggravated during growth phases of the organism. According to the medical literature, in 80-90% of cases the cause of scoliosis remains unclear. Nevertheless, we have followed up the above observation and tested the results of utilizing Matrix Rhythm Therapy for the treatment of scoliosis patients. Matrix Rhythm Therapy derives from the Matrix Concept1 (University of Erlangen, 1996); it acts at the level of the cellular metabolism. The macroscopic mobility, posture and structural characteristics of the body are ultimately the product of cell biological processes on the microscopic scale. Bones and muscles constantly interact with each over the entire lifetime of a person. Bones are generally surrounded by soft tissue, which is held in tension and dynamic equilibrium by the agonist-antagonist relationship. This dynamic tension balance interacts constantly with the psychological and physical forces acting on the body in the course of its lifetime. Matrix Rhythm Therapy is a technique based on rhythmic microextension of muscle tissue by the action of mechanical forces in combination with magnetic fields, which stimulates vibrations of the skeletal musculature within its own natural frequency range of 8-12 Hz (the typical frequency range of muscle tremor and shivering). This effect is realized using the Matrix Mobile, a special therapeutic device which was developed on the basis of clinic-linked fundamental research carried out in Germany at Erlangen University in the 1990s. Application of this therapy leads to an improvement in the transport of various substances to and from the cells, including particularly an improvement in oxygen supply, which is manifest on the macroscopic level by improved elasticity and a resulting improvement in overall mobility. A targeted application of the therapy to the muscle spindles and tendon Golgi apparatus turns off the contraction signals from the nerves and thereby relaxes the muscles. 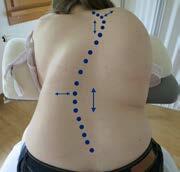 Visible asymmetry of the torso and restrictions in the turning, bending and stretching mobility of the spine. The musculature is clearly under strong stretch tension even in its normal position (shortened muscles). The soft tissue displays clear trigger points and tender points. Commonly noted are malpositioned teeth, anomalies in the upper and lower jaws, massive occlusal abration as well as hypertension, also of the masticatory musculature. Affected children are often very strong-willed, seem to lack emotional balance, and overreact to emotional stress. Affected children typically show a displaced sympatho-vagal balance, i.e. their system is in a chronically stressed state, often with sleep disturbances and obstipation, as in the case of children with cerebral palsy. In the case reported here the patient (17 years old) was exposed, soon after birth, to severe stress and anxiety from repeated operations. At the beginning of therapy she was afraid of being touched, was frightened and uncommunicative. Outside the protected domestic environment she had been subjected for years to daily mobbing and teasing. The entire back musculature including the psoas musculature was found to be shortened, hardened and painful (lumbal hyperlordosis). The spinal column segments were practically immovable in relation to each other. Head rotation was severely restricted both in the right and left directions. The neck was hyperlordotic. In about fifteen two-hour therapy sessions the Matrix Mobile was employed to improve muscle metabolism, and thereby progressively loosen up the periarticular musculature. In parallel, intensive talk therapy and hypnotherapy were given as well as manual mobilization of the spine, first passively and then actively. The patient exercised daily at home. Within three months the patient’s spine had been stretched by about 3 cm and the entire torsion was improved, including head rotation (compare the back contours in the two photos). The hyperlordosis of the cervical spine was eliminated, so that the chin could easily reach the breastbone. Lip closure and breathing have improved significantly. Both digestion and the quality of sleep have improved. The patient feels more relaxed and emotionally balanced than before. In scoliosis patients the hardening of muscles asymmetrically with respect to left and right as the result of trauma, metabolic disturbances or false training has significant effects on growth, especially in early childhood. Our observations, including years of therapy of children with cerebral palsy² show that insufficient flexibility (increased stress) of the musculature, including tendons, sinews and fascia, can have significant effects during growth periods, and can become a cause of scoliosis. A simple analogy is the case of a tree that grows in a skewed way if the wind constantly blows in one direction or if it is tied down on one side. The functional characteristics of the musculature determine the muscle tone as well as the equilibrium of muscle tone between agonist and antagonist, and thereby also the resulting posture and radii of motion. In this context even small differences can play a large role. In accordance with the biological law of functional adaptation, the bone and teeth are integrated into the equilibrium of muscle tone between the tongue and cheeks. The overall physical and emotional state of the organism depends greatly on psychological influences, especially at night (dreams and quality of sleep) as well as active physical work during the day. It is well known how differently the body can react to supporting and challenging stimuli from the environment. From a preventative standpoint it is especially important to pay attention to these systemic relationships during the growth phase, because false postures can lead to permanent misalignments. Dr. Ulrich G. Randoll is a medical doctor, researcher, specialist writer, lecturer and Director of the Dr. Randoll Institute for Matrix Research and Theory in Munich, Germany. In the context of several research projects carried out in 1989-1997 at the Department for Oral Surgery and Trauma Surgery of Erlangen University, he worked on cell-biological questions connected with the differentiation and dedifferentiation of cells. He focused on the natural rhythms of cells in interaction with the surrounding extracellular matrix, as investigated with the help of video microscopy, and drew essential implications for the systemic-dynamic organization of the human body as a whole. From the standpoint of coherent fields he created the scientific foundations for Matrix Rhythm Therapy (MaRhyThe@), a therapy method utilizing rhythmical microextensions of living tissue, propagated into the depth of the body.